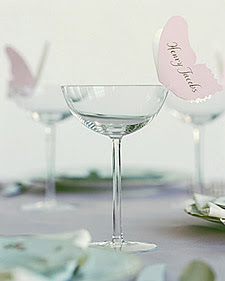 This is such a great idea for a bridal luncheon shower or even girl baby shower! What a whimsical way to show guests their seats. Compliments of Martha of course! Here are detailed directions. Its sort of like making hearts for Valentines day. You could also make some a little larger and add to centerpieces or perched on top of presents.